I hope this update from Toadstool Walks finds you well, warm and rested. I have been enjoying the muffled quiet of winter in Boston, taking time to reflect and plan for the spring while making sure to get outside and breathe the fresh crisp air. Red-tailed hawk have been very present on my walks lately at the Arnold Arboretum and the lack of foliage makes them easy to spot. I’ve enjoyed some blue-bird skies against some glistening snow-covered branches while out on my cross country skis. As the days slowly get brighter, I am reminded that spring is not far away. This past January I attended the first ever trainer gathering with The Association Of Nature and Forest Therapy (ANFT). I spent 5 rich days in Joshua Tree with 17 other certified forest therapy guides and trainers from all over the world. We were able to connect and deepen into the practice of forest therapy as guides, mentors, and trainers with the support of our director and founder. Last year I assisted 2 forest therapy guide trainings with ANFT in Ottowa and Ohio. This year I will be apprenticing on some trainings starting this March in Maryland. As part my commitment to continue growing, learning and deepening into my own personal practice as a guide, I will be attending an Immersion called Way Of The Circle in New Hampshire this May. If you are interested in deep circle work, perhaps you’ll join me there! I am so happy to announce that my spring calendar is now live and includes ongoing regular forest bathing walks, half-day retreats, a multi-week series in May, a restorative day-long forest and sound immersion and a 4-day retreat in the Berkshires in June. Check out my 1-1 nature-connection mentoring services, tarot forest mapping, and some very special collaborations with some wonderful beings. Looking forward to connecting and bearing witness with you this spring. … from finding your tribe. from trusting your intuition, exploiting your gifts, building bridges, creating communities and changing the world! so put yourself out there and trust, you are just one connection away! We all have something to offer as we all have unique gifts and talents. But it can be a battle trying to figure out what they are and where we belong. Even as we hone in on our crafts and begin to understand who we are, there are many obstacles on the path towards stepping into our authentic selves and trusting our intuition. Sometimes, when I find myself at a crossroads, I am lured towards the direction that makes the least amount of sense. As someone who is committed to constantly raising my consciousness and celebrating the particular kinds of gifts, talents and stories that often get overlooked and buried by mainstream culture and social constructs, I can tell you that I don’t do this by myself because I can’t. I do it with the support of other humans and non humans who reflect back to me what I have yet to re-member. When I feel scene, I can uncover a world of possibility that may be lurking just below the surface. Stepping out of my everyday routine and fostering my relationships in the natural world reminds me of our interconnectness, allowing me to return to my everyday life with a fresh layer of motivation to live more fully. Its is an honor and privilege to be hosting this 4-Day Forest Bathing Immersion with my friend, teacher, and mentor, Annabel O’Neil. This extraordinary human inspires me beyond measure with the way she leads with an open-heart and walks the walk of true reciprocity. Join us for a retreat like no other, combining Forest Bathing, Soul Level Astrology, Tarot, and Star Bathing. This experience is aimed to support you on your path of self discovery. The Winter Solstice Retreat is currently full. We have started a wait-list and invite you to still register if you are interested and we will let you know if a spot opens up. Join us at the darkest time of the year for a day long retreat honoring the Winter Solstice. This is a celebration of light and darkness in our environment and within ourselves. Rooting into nature, love, personal power and trust, we will explore the light within ourselves to help illuminate the dark and stuck places of our lives. This Winter Solstice is a space of releasing what is no longer in service, honoring roots and envisioning the seeds of new intentions. Forest Therapy, Yin Yoga and Solstice Ceremony. There will be space of silence, self reflection and sharing. A vegetarian Lunch will be provided as well as tea and snacks. We are honored to be hosted by Yoga for Daily Living in Groton, MA which is about an hour away from Boston and 2ish hours from Western Mass. As the first leaves begin to brighten and darken, I am noticing the places in my life that are catching my eye, and acknowledging these areas that need a little extra attention right now. Whether it be a corner of clutter that is waving at me, or a relationship that could use a bit more tending, I am inspired by the way the leaves make themselves known, announcing their transitions. I find myself in a place of inquiry with this seasonal shift, naturally taking some inventory of my life and noticing the places that may be ripe for a shift as well as the places are best left alone. Lately I have been deeply moved by the power of sitting in circle and bearing witness. I have been reflecting and appreciating the many different kinds circles I have sat in. It is a privilege and an honor to be able to hold space for us to sit in circle as we share some of our connections with the natural world, ourselves and each other. Join me this fall in noticing the changing leaves and fading light while we boost our immune systems and make way for a possible moment of liberation. Whether it be a half day retreat this week at the Arnold Arboretum, a multi-day retreat in mid October, a 3 week series in late fall, or a private integrative Toadstool Tarot Walk, I hope to see you this fall. Half Day Retreats, Multi-Day Retreats, Multi-Week Series, Tarot, And More! 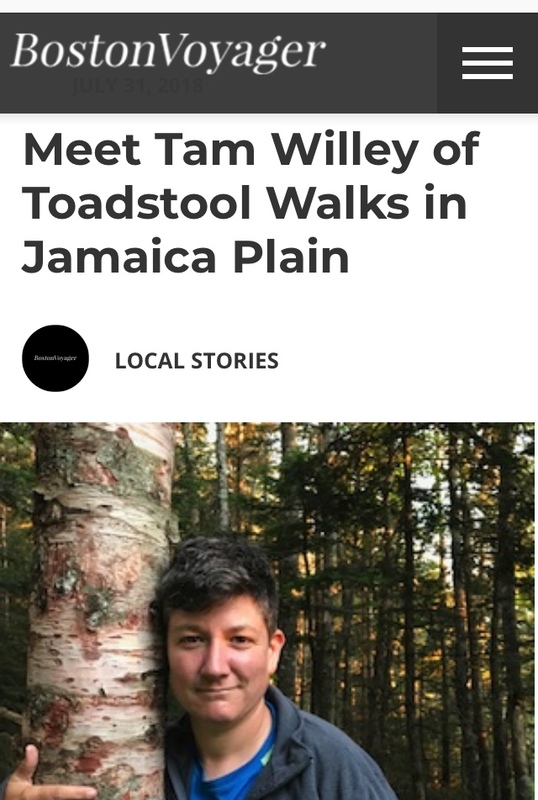 I’m in Boston Voyager Magazine! Last summer around this time, I had just finished my Forest Therapy Guide Training Intensive and as I began my practicum, I was spending lots of time at my sit spot, which is a natural place that I chose to visit regularly at the Arnold Arboretum. During this time I would observe the more-than-human world, noticing all kinds of dramas unfolding that I could only vaguely begin to understand as I sat by a particular tree next to a marsh. The average American spends 93% of their life indoors. When I read statistics like this, I wonder what and who is being considered as an “average” American. I think about choice and privilege and I consider those among us who are confined to prisons, detention centers, hospitals, schools and homes and all our various institutions and industrial complexes. I think about those among us who will not be permitted to go outside for the remainder of their natural lives. I go through the complex reasons why those of us who have the choice to spend more time outside don’t, and I consider the factors that keep us inside. I write this during a heat wave in Boston and as I listen to the hum of nearby air conditioning units, I imagine all the air conditioning units on my street, in my neighborhood, in this city, country and globally. My mind then goes to the cooling refuge of a shady tree and I imagine a light breeze on my skin. I imagine the sound of bird song and the cacophony of the natural world. I imagine dragonflies and butterflies and lush green offering fractal light patterns and a sense of calm. I imagine the Earth dreaming through me and dreaming through this tree that I sit with. As my mind stops thinking, I begin to embody the most basic level of aliveness. Join me under a shady tree next week. With June comes the Solstice and Updates from May! In Boston, there is a chain of parkways and waterways that connect many of the “jeweled” green spaces and gardens called The Emerald Necklace (ENC). From Franklin Park and the Arnold Arboretum to Jamaica Pond and Olmsted Park, along the Riverway to the Fens in Back Bay, this corridor makes it possible to bike or walk from parts of Jamaica Plain, Dorchester and Roxbury all the way to the Public Garden and Boston Common all the while in green and forested settings. I make a point of taking the long way into town whenever possible so I can meander my way along the muddy river and continue the ancient conversations with the more-than-human world which I find helps me cope with the more human-centric elements of “downtown”. This past winter I was walking along the ENC when I found myself particularly struck by a grove of trees on the corner of Brookline Ave and the Riverway. To give a bit of context, this area is home to many world renowned medical research facilities and institutions. Places like Dana-Farber Cancer Institute, Beth Israel Deaconess Medical Center, Brigham and Women’s, Boston Children’s Hospital and Harvard Medical School put this area on the map as a destination for life saving cutting edge medical technology. This is a place where many lives have begun, ended, or been profoundly altered in various ways. Right on this very corner once stood Mass Mental Hospital which was once home/prison to many of Boston’s misunderstood castaways. I was alerted by a grove of trees on this corner. There was something about the way their branches twisted and reached that caught my attention. The feeling was swirly and feral. It was impossible for me not to pause at these trees. They were loud. I looked up at the trees as if to say “What is it? !” I turned around to try and take in what they have been witnessing for many decades when it occurred to me that these trees have been rooted right here while all these hospital buildings and roads have been built, torn down, rebuilt and so on. I looked down at the roots and the soil and I imagined the interconnections of these trees and this medical industrial complex. My imaginal sense was tuning into decades worth of stories being released from these hospitals the same way that trees release chemicals. I pictured the higher branches reaching upward as if to absorb lost energy that couldn’t find its way back down into the Earth. I’ve since formed a relationship with this grove of what I call “witness trees” and whenever I am passing thru, I always stop to pay my respects to this sacred little piece of land tucked along this strip of medical industry. The trees along The Emerald Necklace tell many stories. They move so much slower than the human world. They not only offer a greener way to travel through the city, but they also purify the air and are home to many migrating birds. There is much to explore along the Emerald Necklace. Join me on June 9th at Olmsted Park in witnessing the “witness trees” of The Emerald Necklace. This walk is free and sponsored by The Emerald Necklace Conservancy. Every May, visitors flock to the Arnold Arboretum in Jamaica Plain, Massachusetts to breathe in the fragrant lilac collection and witness the array of color. This flower has a history of medicinal use and if you have ever spent time inhaling this sweet fragrance you may have noticed a sense of calm and relaxation. Spending time connecting with nature has been scientifically proven to treat stress-related illnesses and lilacs are considered potent medicine when it comes to symptoms of anxiety. May can be a time of unwinding as we transition into a new season under a warmer and brighter sun. Whether you’ve been visiting the lilac collection for years or have yet to experience them, I invite you to unplug, de-stress and recharge on a Guided Lilac Therapy Walk. This is a two hour therapeutic experience that combines wandering, sitting, and resting. We will cover no more than a mile, leisurely meandering through the collection as I guide us through a sequence of gentle sensory-opening invitations that welcome us to notice more of our surroundings. Experience the healing power of the Lilacs!